Hi everyone, Steph Ackerman here today with a Happy Thanksgiving Wreath with Bowdabra. With Fall and Thanksgiving heading our way, it’s time to create some decorations. 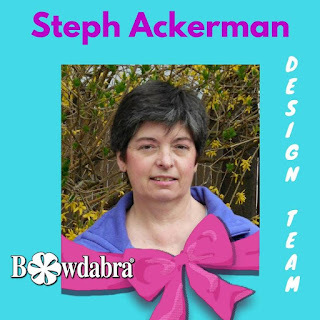 Use the Bowdabra to create fun bows for your projects. Using 3″ burlap ribbon, leave a 3″ tail and place the ribbon in the Bowdabra. Rotate and twist the ribbon, placing it in the channel creating a 3 looped bow. Use the Bow wand to push the ribbon into the channel. Pull up on the Bow wire and tie off. Fluff out. Wrap wreath with green ribbon. Use the Bow wire to tie the bow to the wreath. Tie some ornaments to the bow. While I usually use wired ribbon for bows, I thought I’d experiment with burlap ribbon and I like the results. Although the burlap is heavier, it still forms amazing bows.